JURASSIC PARK DINO BATTLERS : FIRST PICTURES! So, it's finally confirmed. We have a new Jurassic Park toy line to drool over! Steve, ActionFigs.com Editor-In-Chief, recently got his hands over two publicity shots, both loose and packaged of the first Dino Battlers two-pack: Triceratops vs. Tyrannosaurus Rex. You can see both pictures over here: http://www.actionfigs.com/index.php?categoryid=61&p2_articleid=3023. 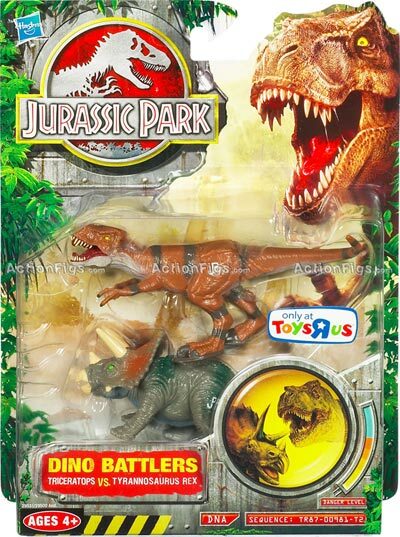 So, yes, they're indeed JP3 toys repaints, but we've got to admit that the new packaging is definitely striking, and much better than the last JP: Dinosaurs lines. It's very clear that Hasbro has put some time over this new line, so let's hope the rest won't disappoint!